Form FAE172 or the "Quarterly Franchise, Excise Tax Declaration" is a form issued by the Tennessee Department of Revenue. The form was last revised in September 1, 2016 and is available for digital filing. 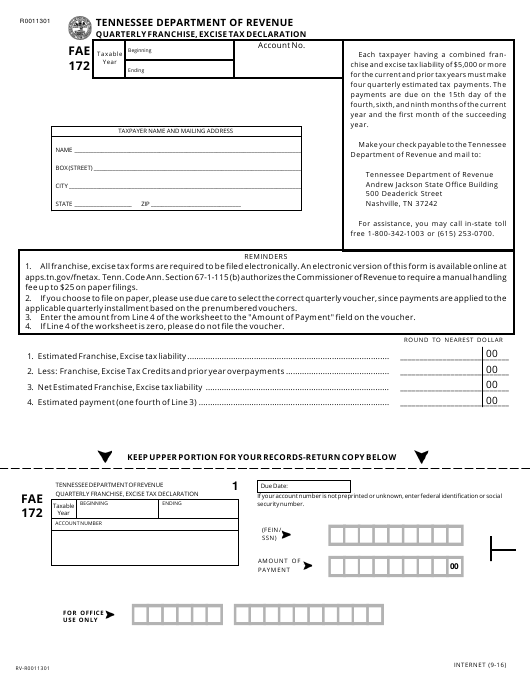 Download an up-to-date Form FAE172 in PDF-format down below or look it up on the Tennessee Department of Revenue Forms website. free 1-800-342-1003 or (615) 253-0700.
fee up to $25 on paper filings. applicable quarterly installment based on the prenumbered vouchers. 3. Enter the amount from Line 4 of the worksheet to the "Amount of Payment" field on the voucher. 4. If Line 4 of the worksheet is zero, please do not file the voucher. franchise, excise tax for the taxable year and make quarterly payments. 1st payment - The 15th day of the 4th month of the current taxable year. 2nd payment - The 15th day of the 6th month of the current taxable year. 3rd payment - The 15th day of the 9th month of the current taxable year. 4th payment - The 15th day of the 1st month of the subsequent taxable year. twelve (12) months; or (b) 25% of 80% of the combined franchise, excise tax liability for the current tax year. installment to the date paid or until the fifteenth day of the fourth month following the close of the taxable year. quarterly voucher since payments are applied to the applicable quarterly installment based on the prenumbered vouchers.